Wilby Illingworth was born in Ossett in 1876, the son of Leeds-born Elizabeth Conyer Illingworth (nee Wilby), who had married James Illingworth in 1869. As early as 1881, Wilby, aged four, is living with his grandfather, Edmund Illingworth, a licensed pot hawker, of South Terrace, Ossett. Edmund was living with his second wife, Hannah, and three children from Edmund's marriages, including 33 year old widower, James Illingworth, the father of Wilby, aged 4 years and his brother, William Henry, aged 11 years. Edmund and his first wife Nancy (nee Illingworth) had married in 1847 and had eight children, all boys, the eldest being James Illingworth. Wilby's mother Elizabeth died in Bramley in the summer 1876, aged 29, perhaps in childbirth since Wilby was born around the same time. Wilby remained with his grandparents in 1891, in the same South Parade home and at that time his grandfather, Edmund, was working as a rag merchant. Edmund’s two children, who were living with him in 1881 have left home, but his youngest son, by his second marriage, and his two grandchildren, William Henry and Wilby, now aged 14 years, were still living in the household. Edmund Illingworth died in 1901. Wilby found accommodation in the Town End home of Sarah Teale along with two other boarders. Wilby was working as a rag grinder, but by 1911 he was working as a male attendant at the Dewsbury Union Work House on Healds Road Dewsbury. He was then 34 years of age. Wilby Illingworth’s army service record has not survived, but it is known that he enlisted at Pontefract, and joined the 5th Divisional Ammunition Column, Royal Field Artillery. His early embarkation for France on the 19th August 1914 indicates that he was a reservist. His service overseas before the 22nd November 1914 also qualified him for the 1914 Star with clasp which was awarded to him, posthumously, together with the British and Victory medals. The 1914 Star with clasp recognised Wilby’s service overseas between the outbreak of the War and the 22nd November 1914. The narrow horizontal bronze clasp sewn onto the ribbon, bearing the dates '5th Aug - 22nd Nov 1914' shows that the recipient had actually served under fire of the enemy during that period. 27th Brigade, Royal Field Artillery was a unit of Britain's pre-war regular army. It is also sometimes shown as 27 Brigade RFA. The Brigade comprised the 119th, 120th and 121st Batteries, this brigade was under command of 5th Division. 37 (Howitzer) Battery, less one section, joined from 8 (Howitzer) Brigade also of 5th Division on the 21st May 1916. On the 21st January 1917, 37 (Howitzer) Battery was brought up to full strength by the arrival of a section from "C" (Howitzer) Battery from 15 Brigade RFA, which was also part of 5th Division, but being broken up. Wilby Illingworth was most probably wounded at the Battle of Hazebrouck, 12th -15th April 1918, which the 119th Battery of the Royal Field Artillery, 27th Brigade, 5th Division was heavily involved in the defence of Nieppe Forest. The British 5th Division entered Nieppe Forest on the 12th April, 1918. The Division made its way through to the eastern edge and established a 2000 yard front facing Merville. "Ossett Reservist's Death From Wounds - Wilby Illingworth (42), Royal Field Artillery, an Ossett soldier, has met his death in the war. At the time war broke out, deceased was an Army Reservist, employed as an attendant at the Staincliffe Institute, and was at once called to rejoin his regiment. 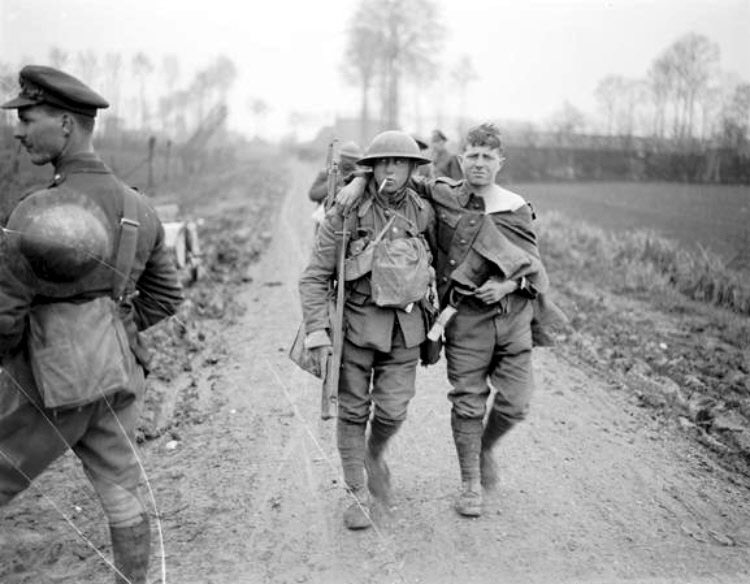 He immediately went out to Flanders, and with the exception of about a couple of months, when he was on the Italian frontier, he has spent his fighting days on the Western front. During the week-end his fiancee, Miss Edith Winpenny, of Dale-street, Ossett, has received a letter, written by the matron of a hospital, stating that the soldier had been admitted to the hospital, severely wounded and gassed, and died peacefully on the 14th inst. Deceased was brought up at Ossett Common, and was well known locally." On the 22nd November 1918 the administration of the estate of Wilby Illingworth of 14, Mallinson Street, Dewsbury, was granted to William Henry Illingworth, a tailor. Wilby, a driver in the Royal Field Artillery, died on the 14th May 1918 in France. The value of his effects was £149 5s 5d. William Henry Illingworth was Wilby Illingworth’s brother. Driver Wilby Illingworth, aged 42 years, son of James and Elizabeth Illingworth, of Ossett died on the 14th May 1918. He is buried at grave reference III. A. 6. at the Aire Communal Cemetery, 2 Pas de Calais, France. Aire is a town about 14 Kms south-south-east of St. Omer. The Commonwealth War Grave Commission's memorial stone for Wilby Illingworth includes these words "After 17 years service. Brother Wm. Henry". These words, requested by Wilby's brother, William Henry, suggest that Wilby had served with the armed forces for 17 years.3 Although both the 1901 and 1911 censuses show him working in civilian jobs, he must have been a soldier since 1901 and who in 1914 was still on the reserve. Men who finished their regular army service spent five years on the reserve, being paid but having to undergo twelve days annual training a year. During this time he could be called up in the event of general mobilisation. From March 1915 to February 1918, Aire was a busy but peaceful centre used by Commonwealth forces as corps headquarters. The Highland Casualty Clearing Station was based there as was the 39th Stationary Hospital (from May 1917) and other medical units. Plot I contains burials from this period. The burials in plots II, III and IV (rows A to F) relate to the fighting of 1918, when the 54th Casualty Clearing Station came to Aire and the town was, for a while, within 13 kilometres of the German lines.